The first half of 2013 was a startling reminder of how poorly traditional asset allocation diversifies actual investment risk. For most, it proved to be an extremely difficult period to make money using the traditional approach because a single risk factor – interest rates – largely drove returns across asset classes. Risk-factor approaches, on the other hand, fared well throughout the turbulence because of the proactive ability to avoid over-concentration in risks, like interest rates, that may creep across asset classes. Starting with renewed worries about Europe in March, sparked by an ECB tax on bank deposits in Cyprus, and ending with several bouts of jitters about the direction of Fed policy, the underlying theme of the first half of the year was a relentless improvement in US economic data. Speculation about the future direction of Federal Reserve policy really began to rear its head in May and June, shocking fixed income markets and sending many other markets into a tailspin as well. Through the end of the second quarter, the broad bond aggregate was down 2.4%, while subcomponents TIPS, emerging market debt and corporate debt were down 7.4%, 6.5% and 3.4%, respectively. Only high yield bonds held onto gains in the first half, registering a meager 1.4% return. Among other asset classes, commodities fell 10.5% while emerging market equities lost more than 9% over the period. US equities were the only solid performers, registering gains of nearly 14%, with high-quality names faring even better. Clearly, quantitative easing (QE) and ultra-low interest rates have created linkages between asset classes that otherwise may have very little to do with each other. 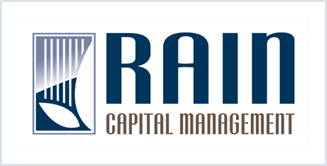 Limiting exposure to this underlying interest rate and liquidity risk has been a major theme in Rain portfolios. We started the year paring back exposure to commodities, TIPS, foreign currencies, emerging markets equities and debt, as well as many bond sectors that are extremely sensitive to interest rates. Fed Chairman Bernanke has said for some time that that level of central bank stimulus would be ‘data dependent’ and we are of the mind that he probably means it. As we have discussed before, we think the most important takeaway of Bernanke’s data-dependent approach is a clear change in direction toward allowing market forces to more actively determine interest rate and credit market conditions; as the economy gets closer to (or further from) the inflation and employment targets that have been established, markets will adjust accordingly. By the time a hike in the Fed Funds rate is justified by economic fundamentals, the rest of the yield curve will have adjusted largely ahead of time. We also think the modern Fed is clearly signaling that the ‘shock and awe’ tactics Chairman Greenspan used to normalize rates in 1994 are a thing of the past. As we speculated in December, markets were not prepared for this change in direction. The shock, manifested in losses across most asset classes, has been followed up by a lot of analysis about who stands where among Federal Reserve decision makers. We think this is somewhat missing the point; the yield curve is now responding to underlying economic strength and is less likely to be dominated by crisis-oriented monetary policy and psychology or speculation about the Fed’s actions going forward. Going forward, we continue to prepare portfolios for volatility across most asset classes. While a changing interest rate environment can have an immediate effect on certain assets, like bonds, the resulting capital flows can have a delayed effect elsewhere, like in emerging markets. Steady economic growth, a healing labor market and improving inflation expectations should all be supportive of US equities and, for the time being, credit. However, it will also be supportive of the Fed reining in excess liquidity and eventually normalizing rates, a process that is likely to continue to inflict damage in nearly any asset that is interest-rate sensitive or that has benefited from the flood of liquidity of the past four years, including equities.